J. Laguna and R. Montiel, Antonio Berni: Historia de dos personajes, Ediciones Siruela, Spain, 1995, p. 164 (illustrated). J. Glusberg, exhibition catalogue, Antonio Berni en el Museo Nacional de Bellas Artes, Buenos Aires, Museo Nacional de Bellas Artes, 1997, p. 130 (illustrated in color). J. López Anaya, Antonio Berni: Estudio Crítico, Buenos Aires, 1997, p. 194-195, (illustrated in color). M. Pacheco, Antonio Berni, Buenos Aires, Ediciones Velox, p. 42 (illustrated). G. Piro, 'Revistas Radar', Buenos Aires, July 1997, p. 12 (illustrated). Berni: Escritos y papeles privados, Buenos Aires, Temas grupo Editorial, 1999, p. 181, (illustrated). Ramona y la adivina of 1976 is a major late work that presents the culmination of a series Berni initiated in 1962. (1) Ramona Montiel is a key figure in Berni's oeuvre, part of a number of characters that populated his works in various media and that marked key moments in his artistic development. Berni described Ramona as "a character from the slums, as if from the lyrics of a tango"(2) and he depicted her life as she undertook various jobs among them prostitute, seamstress and stripper. The series of works, which followed her on trips to Spain, and as she entertained various lovers including an old man, a general, and a sailor, may be summed up the title of one print "Ramona Lives Her Life." It was the life of working class people from peripheral urban milieus that interested Berni throughout his career, as early works such as Manifestación, 1934, in the MALBA, Colección Costantini, Buenos Aires or Club Atletico Nuevo Chicago, 1937, in the Permanent Collection of the Museum of Modern Art, New York, attest. 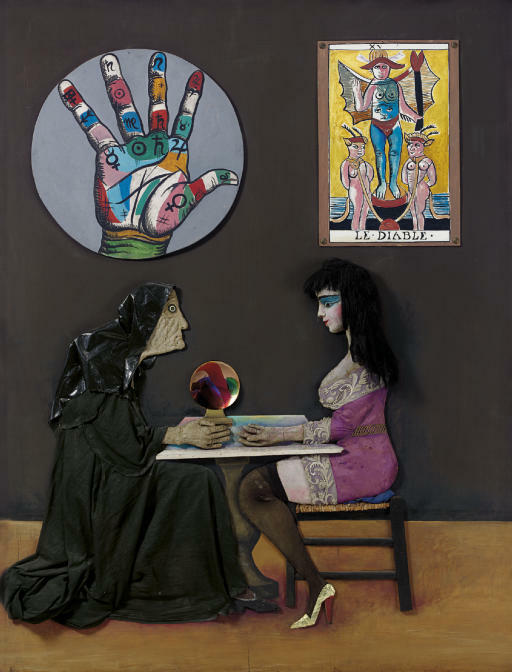 In Ramona y la adivina, we see her consulting a wizened psychic, who gazes into a crystal ball. Above are two images related to fortune-telling--one to palmistry and the other, a Major Arcana card from the Marseilles Tarot deck--the Devil, "it represents the desire to satisfy desires at all cost, disturbance, overexcitement, the use of illicit methods. "(3) In the right hand, Berni depicts lines that shed light on personality and destiny as well as astrological symbols that have an impact on the future, according to palm readers. In particular he draws attention to the mount of Venus, beneath the thumb, which is an indicator of sensuality. At the same time, Berni pointed to his use of recycled materials as another index of daily life in shantytowns. His renderings of Ramona were an arena where he experimented in media other than prints; for example, in the 1960s he created multi-media sculptural works and room sized environments such as Ramona en la caverna, exhibited at the Galeria Rubbers in Buenos Aires in 1967 and others of the 1970s. According to Adriana Lauria, the appearance of Ramona is also linked to the beginning of another major series of works, the Monstruos. (8) This constant artistic experimentation, which challenged the separation between media, coincided with Berni's ethical and political commitment throughout his career. Berni, born in Rosario in 1905, trained there until a fellowship enabled him to travel to Europe in 1925. There he attended the workshops of Andre Lhote and Othon Friesz, and took an interest in Surrealism and Metaphysical painting. At this time his political commitment led to friendship with Louis Aragón. He returned to Buenos Aires in 1930, where he had his first exhibition two years later and met David Alfaro Siqueiros in 1933. In the mid 1930s he authored critiques of the ideological contradictions of Siqueiros' muralism and proposed a new type of realism. In the 1950s he began to depict the inhabitants of marginal urban areas using collage techniques and working in various media--among them prints, paintings, environments and assemblages. He won numerous prizes throughout his career, among them the 1943 Gran Premio de Honor of the Salón Nacional, and the Grand International Award for Engraving at the Venice Biennial in 1962. Important exhibitions of his work include retrospectives at the Di Tella Institute, 1965; Museo Nacional de Bellas Artes, 1984; Cantos Paralelos, Jack S. Blanton Museum of Art, University of Texas, Austin, 1999; and Berni y sus contemporáneos. Correlatos, held at MALBA-Colección Costantini in honor of the hundredth anniversary of his birth, 2005, and demonstrating the impact of his work on other Argentine artists. Miriam Basilio, Assistant Professor of Art History and Museum Studies, New York University. 1) For discussion of the origins of the Ramona series, see A. Lauria, "Correlatos entre Berni y sus contemporaneos. Diálogos argentinos," in Marcelo Pacheco, Berni y sus contemporáneos. Correlatos, MALBA--Colección Costantini, 2005, pp. 17-29. 2) Antonio Berni, in M. Nanni, Berni, Buenos Aires, Museo Nacional de Bellas Artes, 1984, p. 25. Translation by A. G. Bork, re-printed in M. C. Ramírez, Cantos Paralelos: La parodia plástica en el arte argentino contemporáneo, Jack S. Blanton Museum of Art, The University of Texas at Austin, and Fondo Nacional de las Artes, Argentina, 1999, p. 191. 3) Julio Sánchez, "The Pilgrim and the White Goddess," in Pachoco, Berni y sus contemporáneos, pp. 184-187; 186. 4) Antonio Berni, in M. Nanni, Berni, Buenos Aires, Museo Nacional de Bellas Artes, 1984, 25. Translation by Albert G. Bork, re-printed in Ramírez, Cantos Paralelos, p. 191. 5) M. C. Ramírez, "Confrontaciones con la contramemoria: Fealdad y perversión(versiones)" in Ramírez, Cantos Paralelos, pp. 24-89. 6) Antonio Berni La figuración narrative en "Le Monde" en question, Paris, ARC, 1967. Reprinted in M. Nanni, Berni, cited in Ramírez, Cantos Paralelos, p. 190. 7) For discussion of Berni's parodic strategies, see M. Pacheco, "La parodia y los juegos de la verdad," in Ramírez, Cantos Paralelos, pp. 90-120. 8) See Lauria, "Correlatos entre Berni y sus contemporáneos. Diálogos argentinos," in Berni y sus contemporáneos, pp. 24-26.